The Daily Clog » Weekend Free-view: Be an Extra! See a Shipwreck! Celebrate F. Korematsu! For more swing dancing following Wednesday’s grand opening of the Dancers’ Den, Lindy on Sproul offers a weekly lesson and dance party on — where else? — Upper Sproul. For some wine and cheese and art (the Clog does not condone illegal activities but finds it worth mentioning that nobody usually cards at events like these), Photo Laboratory in West Berkeley is hosting a photography exhibit, Lightfall: 5 Photographers, opening reception. Oakland Chinatown is throwing a Lunar New Year celebration all weekend to herald the Year of the Rabbit (this means lots of red, lots of food and lots of Asian people doing Asian things), while some hikers will be leading a Shipwreck Hunt Hike to admire exposed low-tide 100-year-old shipwrecks in San Francisco (specifically, two of purportedly 200 that have met their doom on the SF shoreline). The Fred Korematsu Day Celebration in Wheeler Hall is going to be memorable: Jesse Jackson, Beau Sia, “Of Civil Wrongs and Rights: The Fred Korematsu Story”, all for $5. We knew there was a reason we chose to come here (and not, you know, some other school that has a tree for a mascot). Also, be in a movie with Matt Damon, Jude Law, Gwyneth Paltrow, Kate Winslet, and Marion Cotillard! Okay, so the likelihood of being cast is already very low, not to mention actually being in a scene with them, but still, we’d like to dream. 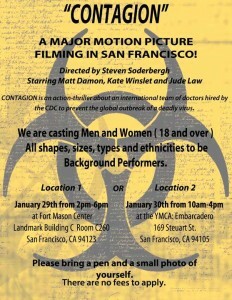 The new Steven Soderbergh film, “Contagion,” is doing a casting call for 2000+ extras in San Francisco this weekend. All you need is a pen and a small photo of yourself, and even better, they’re looking for “all shapes, sizes, types and ethnicities” to presumably represent the dying masses (the film is called “Contagion,” after all). In 4th Street’s Books Inc., L. John Harris, local author of “Foodoodles: From the Museum of Culinary History,“ is hosting a panel discussion with some of the “Legends of the Gourmet Ghetto,” chefs from the north Shattuck area that features so prominently in the Berkeley and Bay Area food scene. Finally, the Berkeley Art Museum is conducting a guided tour through one its new sculpture exhibits, Eva Hesse: Studiowork.